Many people think that ‘skis are small with a limited amount of space, so you can only carry so much gear. 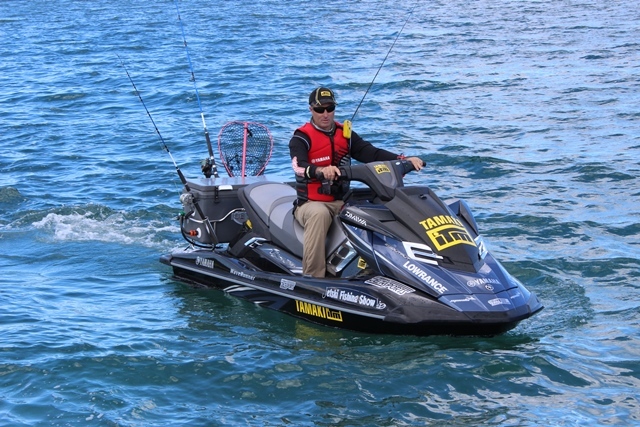 However, I’m able to accommodate everything on my Waverunner that was carried on my boat – sometimes more, it just needs to be set up so the available space is fully utilised. When putting a fishing ‘ski together, most people will start with fishing rods and reels, but if you’re serious about fishing, safety equipment is a priority. There are several items I call ‘safety equipment’ that others may not classify this way. Clothing, for example. Wearing suitable clothing makes a huge difference when out on the water, as you will often be out in the blazing sun in summer or the freezing cold in winter. In winter the obvious problem is the cold temperature, and the rain can make it even colder. Layers of clothing are the key: wear a lined thermal underneath a long sleeve top, a life vest over that, and have a jacket on top to guard against the wind, rain and any saltwater splashes. These layers allow me to slowly strip back over the day as it warms up; even a nice day in the middle of winter can get quite pleasant. In summer, I wear the same long-sleeve top without the thermal underneath; instead of protecting me from the cold, this is now stopping me getting sunburnt. The top is light enough to dry quickly if it gets wet, but thick enough to provide the UV protection required. I also wear long, fast-drying trousers year-round these days, so again I’m kept warm in winter and protected from the sun in summer. Hats are a must – particularly in summer to ward off the sun. Polarized sunglasses are also important to protect the eyes, while sunscreen and a buff keep the sunburn away from any areas of skin still exposed. So now we are properly clothed, we can look at the more traditional safety equipment that will help us communicate and be rescued in the event of a mishap at sea. Anyone who spends a lot of time on the water should know that you need at least two forms of communication; I prefer three. The obvious one, which pretty much everyone has, is a mobile phone, and ideally it would be waterproof. However, even waterproof phones rely on having coverage. A hand-held radio is the next port of call. On a boat, the radio would be fixed to the boat, and there are some people who do this with ‘skis. I personally do not recommend having a radio fitted to the ‘ski, unless you have an additional hand-held radio on you. The risk of coming off a ‘ski is much greater than falling out of a boat, so you must have access to your radio when separated from the ‘ski and are in the water. Incidentally, when underway you should always have the kill-switch lanyard attached to your arm so if you do fall off, the ‘ski will stop, giving you a reasonable chance of getting back to it. The third item of equipment is one that’s seldom used, but is very important. The PLB (Personal Locator Beacon) is my backstop that I treat as someone watching over me. In the event of an emergency in this situation, the PLB is designed to be a lifesaver. Upon activation, it sends your exact GPS location to a rescue centre and the wheels are set in motion to start a rescue.